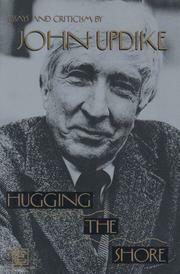 It's entirely possible that history's choice for the finest literary critic to find steady exposure in the pages of the New Yorker will not be Edmund Wilson--but rather John Updike, who here gathers over 100 reviews and essays from recent years. The years go by and he simply gets better: the style is astonishingly fluid without hurry; he never relaxes with pen in hand; he grows less sentimental, more minutely discriminating. Old enthusiasms taken on a finished, reflective patina--as in the essays on Nabokov, toward whom Updike is no less admiring now, but with more awareness of a narcissism at work, hollowing out the center of Nabokov's art. (Updike sees this as Saul Bellow's problem too.) And, if the critical breathiness of some of Updike's early appreciations has been reined in, there's been a compensatory opening-up to thoroughness: in order to study Vonnegut without patronization, Updike reads and discusses every single book; Muriel Spark, Queneau, Grass, and Calvino receive the same magisterial overview. Not too surprisingly, then, Updike's favorite sort of fiction strains--like his own novels and criticism--to make things plain, to bring things to light. ("The narrow skin of sensation just this side of darkness if where [Henry] Green's writing lies.") Likewise, a piece on Roland Barthes highlights Updike's innate distrust for methodology's short cuts, his belief in a certain sort of redemptive hard work, a grace of excess. But while much of this collection reaffirms quintessential Updike attitudes, at least as impressive are his searches for literary distinction in styles far different from his own: an exploration of the difficult Robert Pinget; a consideration (and, finally, a dismissal) of Peter Handke; an almost startling homage to Bruno Schulz. True, there are weaker ventures in this generous collection--into poetry, classic American writers, ethnology and sociology (Doris Day! ); and when Updike writes as an active, believing Christian, he can be slightly too crabbed. (A review of the new Oxford Book of Christian Verse complains of not enough eschatological opacity.) Yet whether taking on Hemingway, Christina Stead, or Italian folk tales (one of the few demolition jobs here--and very heady), Updike's focus is never coyly hidden; "Personal experience taken cabalistically: this formula fits much modern fiction and, complain though we will, is hard to transcend. Being ourselves is the one religious experience we all have, an experience sharable only partially, through the exertions of talk and art." The least lazy of our critics, he may now be our best.